'Beatriz At Dinner' Skewers A House Full Of Well-Off Guests Director Miguel Arteta and screenwriter Mike White collaborate on a film featuring Salma Hayek as a healer who finds herself at a very uncomfortable meal. 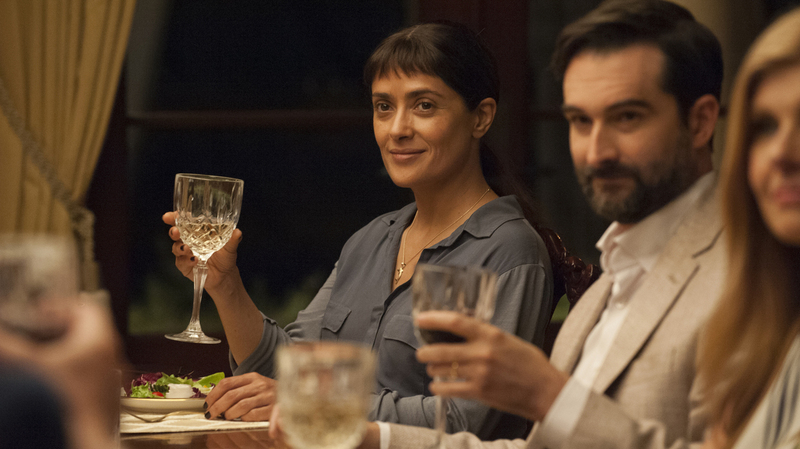 Beatriz (Salma Hayek) and Alex (Jay Duplass) in Beatriz at Dinner. Every so often, brightly lit Hollywood comedies set in West Coast mansions will slip in five minutes of light-relief banter between a Latina housekeeper and her wealthy white liberal boss. Mild joshing ensues about the cluelessness or prejudice of the employer, perhaps with a good-natured roll of the maid's eyes thrown in. That done, everyone slips back into their assigned slots in the social pecking order. Point taken, but not really. Beatriz at Dinner, a new collaboration between director Miguel Arteta and screenwriter Mike White (The Good Girl, Chuck & Buck, among others), is not that banter or that movie. The Mexican-born Beatriz, played with restraint by a deglamorized and slyly tamped down Salma Hayek, is not a housekeeper. She's a healer with her own business and a gentle, spiritual soul. An apparent ingénue in sensible jeans and adolescent bangs, Beatriz keeps goats in her Altadena apartment and wonders why the neighbors complain. She's funny and anachronistic in context, but she's not being laughed at, at least not by the filmmakers, who bring Beatriz front and center in a black comedy of manners with an earnest undertow that places ethnic and class inequality on an audacious continuum with wanton environmental destruction. Invited to dinner when her car breaks down at the Newport Beach McMansion of her client, Kathy (a very good Connie Britton), Beatriz takes it on trust when Kathy introduces her as "my dearest friend" to a small group of well-heeled guests assembled to celebrate a commercial takeover of protected land they're about to turn into millions in hard cash. Despite barely suppressed sneering from the visitors, played by Chloe Sevigny along with Transparent's Amy Landecker, Jay Duplass and John Lithgow, Beatriz and Kathy begin the evening believing in their friendship. The train wreck that follows — hilarious with a growing edge of sinister — will strip away everyone's illusions on that score, and a few others. With hardly a raised voice, the air soon fills with poison. Arteta directs with irreverent brio mixed with a somber touch, but Beatriz at Dinner is (almost) all talk, and dependent on the crisply funny dialogue that keeps taking left turns into the unexpected. White is always on the side of the marginal and the dispossessed, but he likes to throw us off our game a bit so we don't just go home smugly confident that we've done our bit for justice and empathy. Beatriz, like the others, walks a purposefully confounding line between naturalism and caricature. She hugs everyone on sight, offers free treatments all around, and asks Kathy's incredulous husband to bring her a glass of wine. But though she's getting drunker by the minute, Beatriz is also an astute observer whose reflexive desire to please wanes visibly as she mixes it up with the wonderfully named Doug Strutt, a cocksure, Trump-like developer played with delicious glee by Lithgow, whom she thinks she recognizes from her childhood in Mexico, when her family, community, and habitat were destroyed by a corporate predator. War is declared, and Doug and Beatriz perform a rivetingly complicated pas de deux that pitches his boorish charm against the coiled ferocity that grows within the unwanted guest. Is Doug, who knows what he is and is frank about fiddling while Rome burns, the enemy here? Perhaps, but the target at the bullseye's center is the liberal elite itself, nice enough self-deceivers like Kathy who commit daily hypocrisies while persuading themselves they've conquered prejudice, yet who flee in terror when confronted with contradiction and pushback. It's Kathy's abrupt withdrawal from her "friend" and her panicked attempt to revert to patroness that really cuts, and carries the action from wicked comedy into potent melodrama. In the movie's several startling endings you may see a horror story or a Greek tragedy unfolding. Beatriz at Dinner is also a love story that restores agency to a woman who has lost all, and asks us to take a hard look at our own.